I’m talking about reflectors that you can buy by mail order. Over the last month we have bought an extra three 5 in 1 reflectors. Let me explain what these are, in the centre you have a diffuser that you can put between the subject and the light, and this is formed on a spring wire frame. 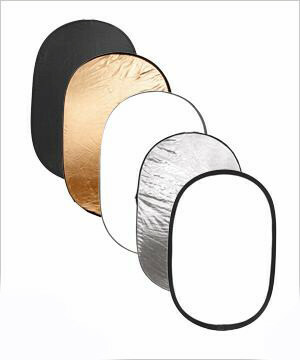 This can be used on its own or you put on a reversible coat that zips up giving you a choice of 4 reflector surfaces usually white, silver, gold and black. White is the most commonly used, silver is more powerful but harsher, gold produces a sun tan effect and black stops the reflection and helps to create character lighting. These fold down with a twist to fit in a bag a third of their unfolded size for transportation and storage. We bought three different sizes from three different sources, two in the UK and one from Hong Kong. They are all 3 inches in each direction smaller than the size they were quoted as. We think the reason this occurs is that they cut out the reflector material the size they state, and then by the time you allow for seams, making up the parts, adding zips etc it ends up being undersize. The three don’t appear to have been made by the same plant, or have other common features. The packaging, where it showed it, showed the size it was sold and not the actual size it was. It would appear that others have not thought of measuring reflectors as none of the suppliers appeared aware of the situation when I contacted them. Our three latest 5 in 1 reflectors were quoted at 43 inches round, 37"x49", and 43"x70" and actually each is 3 inches shorter in each direction. As the same people sell light tents, we will measure our various light tents at some point and see if this ‘undersizing’ also applies to any of them. Of course they will still do the same job and this difference in size is not critical, and is probably a cultural thing, in the countries where they are made this is probably what was thought to be correct while in Britain we expect when we buy an item by a size for it to actually turn out to be the size we ordered. In the past we have bought Lastolite reflectors, backgrounds, HiLites and other items and in each case the sizes they quote are the actual sizes of the finished products, plus their bags, zips etc are of far higher quality. However the latest ones are all well made and were far cheaper than the Lastolite equivalents. As these items increase in size they increase in price, so the moral is when buying these cheaper makes and comparing prices allow for the fact that they are likely to turn out to be smaller than expected and if the size is critical, then perhaps order the next size up. Another useful item we obtained recently is a reflector stand, this is a lighting stand with an additional telescopic arm with sliding clamps to hold a reflector. A small or round reflector could probably be held at any angle, while a larger one could be held vertically or used as an alternative portrait background, or leant at an angle when leaning on something else. We often use the backgrounds that come with the light tents for still life and the like when using more complex lighting so not using the light tent, and this is often done using a boom arm on a lighting stand, while the reflector holder will now be able to be used for this task. This can of course be done using any piece of material. The lighting stand that came with it has the normal fittings we use, so the Nikon creative lighting stands can be used with this. The lighting stand was in a carry case provided but there is no room in this of the reflector arm or connector block. We have two other new lighting stands, that are somewhat lighter and a little smaller.